Trust between civil society and the state is a necessary pre-condition for successful public policy in advanced industrial democracies. It is all the more important following a mass catastrophe that affects hundreds of thousands and upends the rhythms of daily life across the country. Choices made by the Japanese government and energy utilities during and after the compounded 11 March 2011 disasters damaged relationships between civil society, utility firms, and the government. 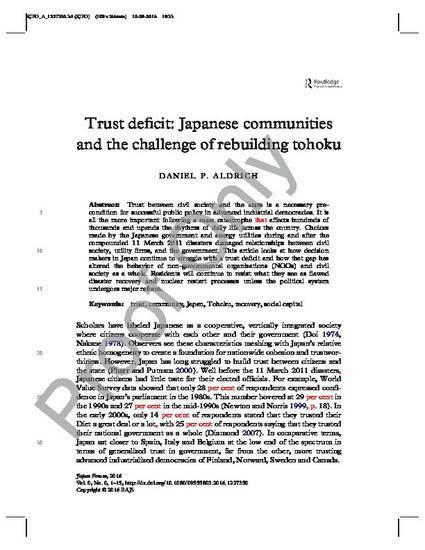 This article looks at how decision makers in Japan continue to struggle with a trust deficit and how that gap has altered the behavior of NGOs and civil society as a while. Residents will continue to resist what they see as flawed disaster recovery and nuclear restart processes unless the political system undergoes major reform.